Here's a spooky thing to think about this Hallowe'en. This is The Silence. I'll assume you know about the Silence from watching Doctor Who. This is Slenderman. 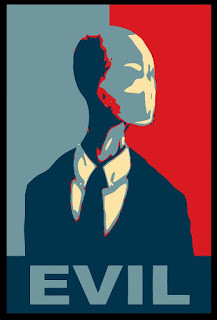 Slenderman (Or the Slender Man, if you prefer) is one of those internet memes you either know about or you don't. If you don't, an ideal place to start is this Darklore article by Cat Vincent, along with his follow-up article in the latest volume. As you can probably guess by looking at the picture, when the Silence first appeared in Doctor Who, people who were familiar with Slenderman thought, 'Blimey, it's Slenderman!' The similarity is remarkable when you consider that, as well as his blank white face, height and his 'men in black' suit, Slenderman was sometimes said to have the ability to make people forget that they had ever seen him - the defining ability of the Silence. 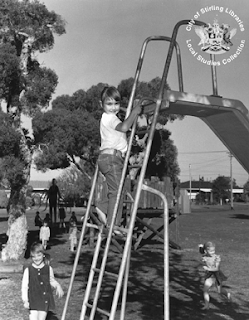 As Cat Vincent's articles explain, Slenderman was an internet meme that rapidly went wild, spreading into videos, Alternative Reality Games, fiction, people's dreams and, if callers to radio shows were to be believed, into reality. 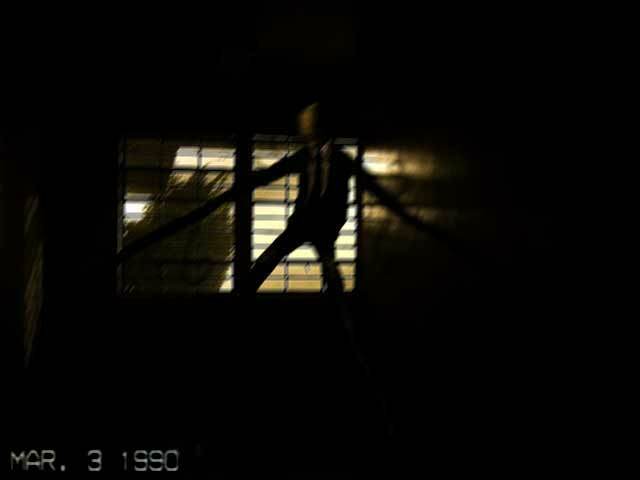 This was the creepiest aspect of Slenderman; he was created in the imagination of many, but because he was imagined to be able to cross over into the real world then he was able to do so. He was believed to be a type of tulpa, a thought-form that takes on a more material form. 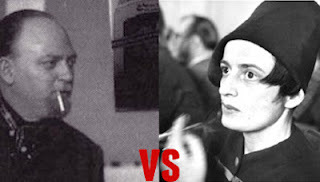 Those who have read my book The Brandy of the Damned may see a similarity with the character of Orlando Monk. But while Monk is a public domain Trickster/catalyst, Slenderman is a monster - and he is the monster of our age. Frankenstein was the dark shadow of the Age of Enlightenment and Dracula was the dark shadow of the Victorian repression, but Slenderman is the dark shadow of now. He is an emergent property of a distributed network. He's the nightmare of the current world. Even for those who could never take the idea that he could develop a physical form seriously, he was still more than an idea. He was active. He displayed will. In my probably-forthcoming book about The KLF, I talk about Doctor Who in the context of Alan Moore's concept of ideaspace (it's that sort of book, don't say I didn't warn you). If you are not familiar with ideaspace, it comes from Moore's interest in whether 'ideas' can be considered to exist in any meaningful sense. Moore takes the view that ideas do exist, and ideaspace is a model he created to understand how they work and how they behave. Ideaspace can be compared to Jung's 'Collective Unconscious', de Chardin's 'Noosphere', or Richard Dawkins' concept of 'memes'. Indeed, Dawkins' memes and Moore's ideaspace can be thought of as roughly the same subject described by two wildly different men with completely different beliefs who arrived in the same place from almost opposite starting positions. Doctor Who, despite not having an individual creator, has become the most complex and extensive fiction of our time. The TV show is only a fraction of it. It is a never-ending story made up of thousands upon thousands of TV episodes, audio plays, books, comic strips, plays, games, fan-fiction and the like. It has evolved in a way that is exponentially different to any other British fiction from the mid-twentieth century. In ideaspace, then, Doctor Who would be a big deal. If ideaspace behaves like Moore suggests, and if you were to look for evidence that a fiction like Slenderman was behaving like a fiction that was somehow alive, then Doctor Who would be an obvious place to look. So the fact that the Silence popped up in Doctor Who suddenly becomes interesting. Of course, the rational interpretation of the Slenderman/Silence similarities is that the Silence were inspired by (or, if you prefer, copied from) Slenderman. However, if the rules of Moore's ideaspace have any validity, there is no need for the creators of the Silence to have any conscious knowledge of Slenderman. What we have here, therefore, is a useful little real-world scenario that allows us to test whether Moore's ideaspace works as he suggests that it does. I'm not, sadly, in a position to quiz Steven Moffat, the initial creator of the Silence, if he was consciously inspired by Slenderman. However I have been able to ask Jason Arnopp, who researched the subject in order to write the 'Designing the Silence' article in the Brilliant Book of Doctor Who 2012. He confirmed that of all the people he spoke to involved in the creation of the Silence, no-one mentioned Slenderman. 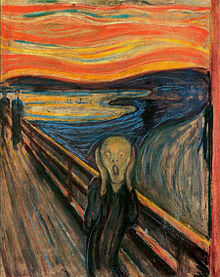 According to Arnopp, there was reference in the original script to the face of the Silence being reminiscent of Edvard Munch's The Scream, and this was the starting point for prosthetics designer Neill Gorton's design of the monster's face. 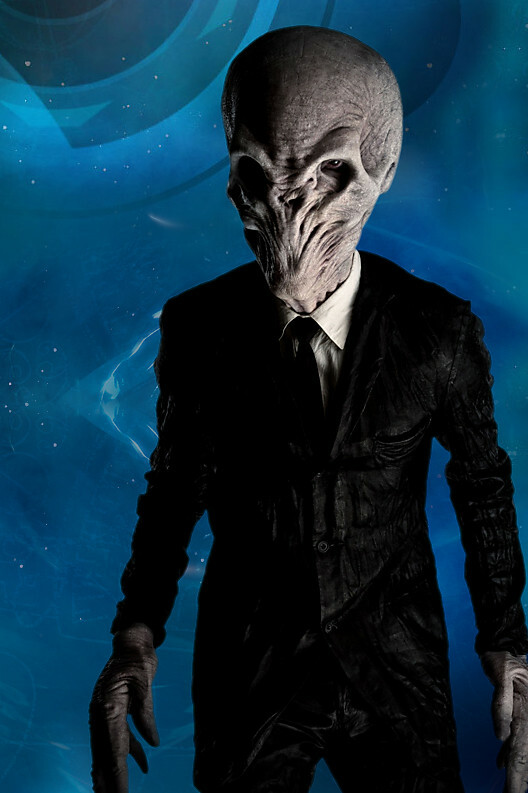 The script also referred to the Silence "looming" over The Doctor, so the designers made them tall. 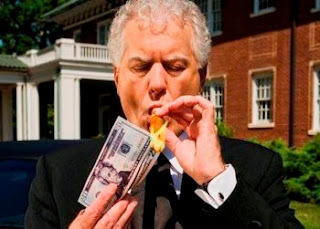 The black suit was not in the script, but an outfit was cheaper than a monster body so several outfits were suggested. The 'men in black' suit was chosen to fit with the 1960s American setting of their debut story. The Silence, then, were not a conscious copy of Slenderman, but emerged in the space created by the creative efforts of a number of different minds. The most rational explanation for the remarkable similarity between the Silence and Slenderman is that it is all just a coincence. 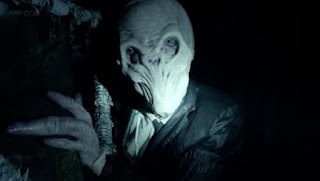 A different explanation is that ideaspace does behave like Moore describes, and that the concept of Slenderman was able to press itself into the fiction of Doctor Who, without any of the creators of the Silence being aware that this was happening. With this is mind, it is interesting to consider the long extended middle figure of the Silence. This was an innovation from designer Neill Gorton who told Arnopp that the intention behind it was to make the design more alien and creepy, and that extended finger was inspired by the extended middle finger of the Aye-Aye lemur. Gorton told Arnopp that he wasn't quite satisfied with this aspect of the design. "We just didn't get it quite bony enough," he said, "It worked fine in the show, but if we do them again I'll make those strange, long hands even scarier." 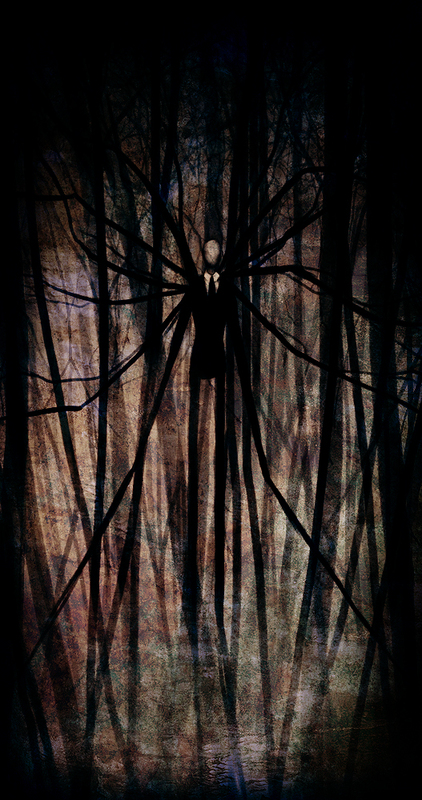 One curious aspect of Slenderman shown in many illustrations is that his long arms stretch out and become tentacle-like. 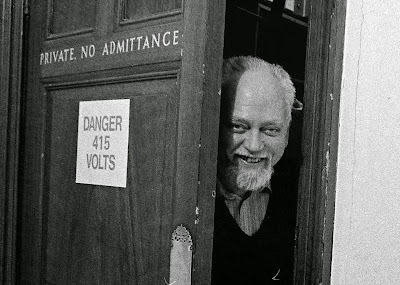 There was nothing in the script to suggest that long finger that Gorton added, yet he felt an urge to stretch it out, and somehow knew that he hadn't gone far enough and didn't get it quite right. All of which is suggests that ideaspace may behave like Moore describes, and that the concept of Slenderman had attempted to press itself into the fiction of Doctor Who, without any of the creators of the Silence being aware that this was happening, with a remarkable level of success. Or in other words, it's evidence that the dark shadow of our age behaves as if it is more alive than a fiction should do. Especially when that fiction that is a monster. So with that thought - happy Hallowe'en everyone! Steam Engine time, John - Steam Engine Time. Excellent article! I'm reminded of Sheldrake's morphogenetic fields. It gels nicely w/ the noosphere/collective unconscious. 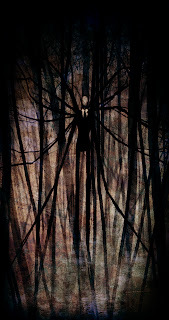 Slenderman is kind of the shadow zeitgeist (literally), and it seems natural for that form to pop up again and again. I wasn't aware of the Silence before, but I can see the overlap. Thanks for this. I've not seen the Doctor Who episode with The Silence, but he/they does bear a resemblance to 'The Gentlemen' from Buffy The Vampire Slayer, as does Slenderman. As far as I'm aware, The Gentlemen came first, so it could be that both Slenderman and The Silence have roots there? 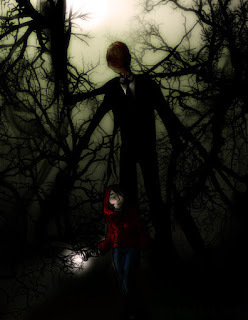 If anything, it's probably more accurate to describe the Silence as the lovechild of Slenderman and the Gentleman. Sorry, did I say 'more accurate', I meant 'more disturbing'. This are the things that the new generation of kids are very afraid. Specially the slender man, my son is very afraid of him. The first time I saw such a horror was back in the early 80's in Sapphire & Steel, assignment 4. The agents encounter the malevolent 'Shape', believing him to be a man. Before long they realise that each is seeing a different person standing in the same space. The revelation is that in spite of his many looks, he has no face. Sapphire & Steel are protectors of this world (or time corridor), defending it from those things that lurk outside of time and space, seeking to gain entry and wreak havoc. The Shape had found a way in. Out of all the rather disturbing assignments, this one seemed to carry the most gravity and highlighted the show at its very best. So - on to my point. The space / time corridor that's being protected by the two agents is the 'real' world that we see about us. Beyond space / time? Perhaps you could consider that as idea space. And 'The Shape' could be considered as a proto-slenderman? In which case, writer P J Hammond a) described a form of Ideaspace over 30 years ago (much like Moore with Promethea, via an artistic medium) and b) created his own mini paradox by spawning Slenderman through his own artistic efforts. By that, I mean, he's created the very crack in space / time that agents Sapphire & Steel fought to defend - allowing this horrific thought form to get a foot hold in the real world. Naturally, this is an uneducated ramble and just a bit of fun thinking. I'm sure it can be easily refuted. Perhaps it contributes something different to the discussion. Idea: Slendy is DESCENDED from the Silence!